This is a number that is on the top of a carb box on a P200 Vespa, on the frame near the serial number, on the frame of a Lambretta, on Vespa exhausts, and on the horns but it has nothing to do with the serial number. It stands for "Ispettorato Generale Motorizzazione", which translates to "DMV General Inspectorate". The "Motorizzazione" (whose extended name is "Motorizzazione Civile e Trasporti in Concessione", "Civilian Motoring and Public Transport Licenses (dept.)" is the equivalent of the DMV. It's a branch of the Minister of Infrastructures and Public transportation, and the IGM is the office that certifies a vehicle as street legal. Every motorized vehicle must be street legal in Italy. Not only the vehicle, but its most important parts too, such as engine, exhaust system, carbs, lights, light glasses, and so on. In Italy if your combination isn't a legal one, the vehicle can be impounded and shouldn't pass periodic service checks, thus losing street legal state. In America it is often mistaken by authorities as the serial number and even written down on the title. 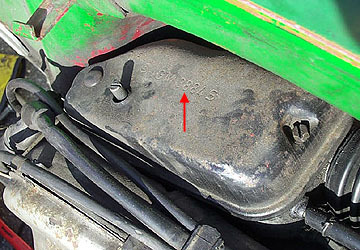 Image of the IGM number on a P-Series carburetor box. 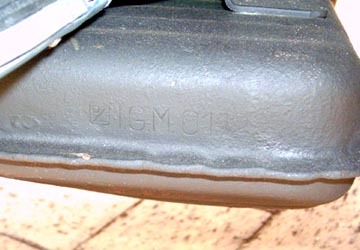 Image of the IGM number on a VBA1T exhaust. 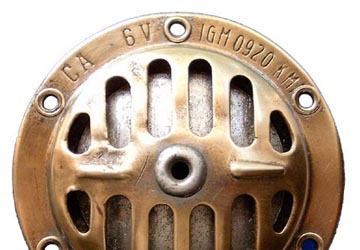 Image of the IGM number on a Vespa horn. Thanks to Paolo Marchiori for the IGM info..